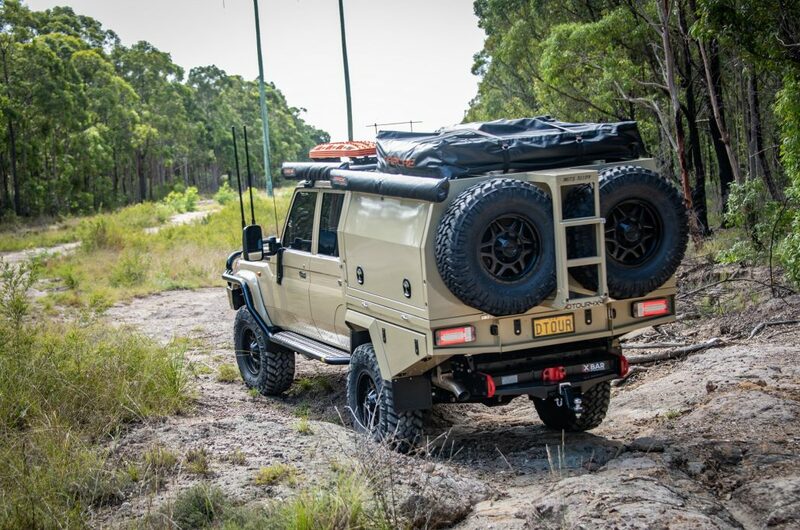 2019 is shaping up to be another big year of 70 series Jmacx builds and they just keep getting bigger and better. 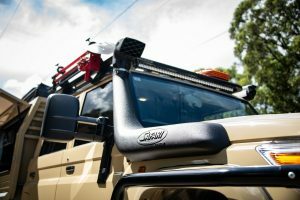 Our customer Chris came to us last year with an idea of putting together his ultimate dream touring machine and this week his dream became a reality as we put the finishing touches on one of our biggest builds to date. 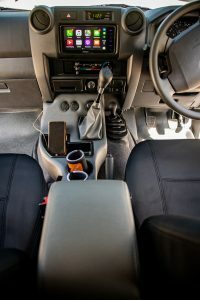 It was also the first time we worked together with one of the biggest up and coming canopy manufacturers – Mits Alloy, to come up with a custom fit-out to suit Chris’s exact needs for touring. We couldn’t be happier with the results and Chris is over the moon with his new build. 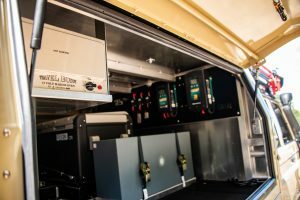 The guys at Mits spared no attention to detail and set about with Chris in configuring a layout that incorporates a Waeco CFX75 Dual Zone fridge and Clearview Pantry/ Kitchen both on Clearview drop-down slides. 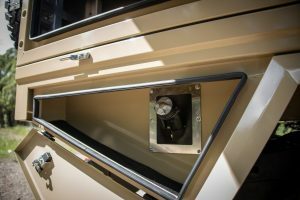 A Travel Buddy 12v marine oven keeps the pies warm and additional water tanks are fitted for long distance touring. 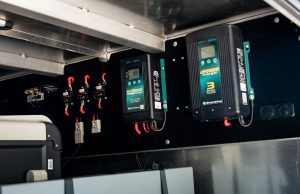 This set-up is powered by a 40A charging system by Enerdrive using Dc and AC chargers powering a 200A/hr Enerdrive lithium battery. 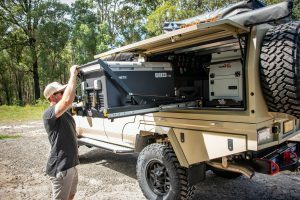 There’s also enough LED lighting to light up a football field with 2 Stedi 11.5″ light bars mounted off the side of the Rhino Pioneer Platform to light up the campsites. 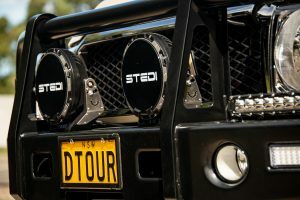 The guys at TJM Hunter Valley spent several painstaking hours to wire in a system that is built to take on the harsh Aussie conditions and provide consistent power on-demand for this ultimate touring set-up. 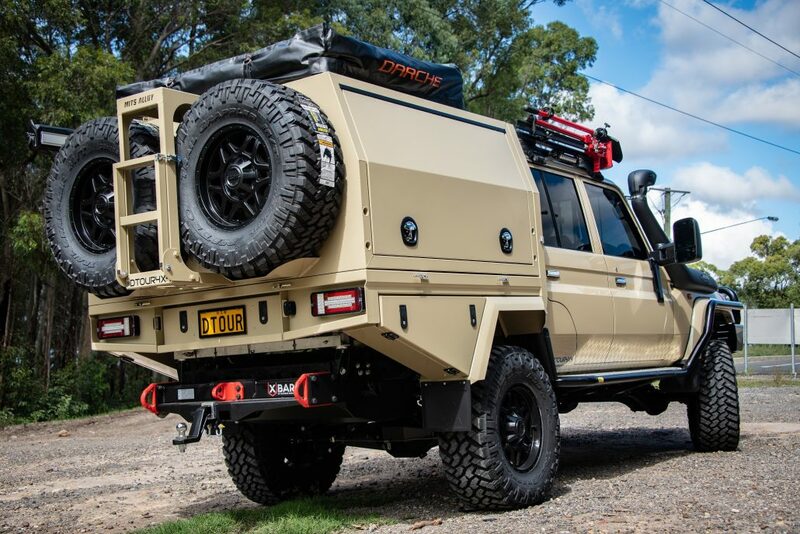 A Darche Panorama roof top tent and 2 Darche Awnings finish off this mobile, ready to go campsite and the whole canopy is finished in colour coded Sandy Taupe which we think is an awesome touch to one of the best laid out canopies we’ve seen roll out of our workshop. 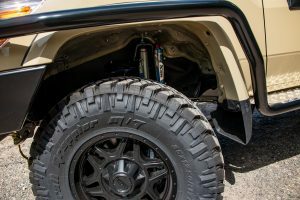 The other stand-out feature for this build is of course the Jmacx rear coil-spring conversion. 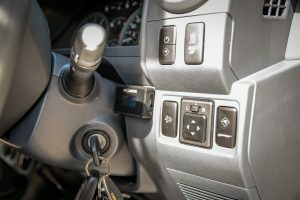 The off-road capability is improved by adding greater axle articulation, corrected wheel track, a more refined ride and the Kings remote reservoir shocks soak up the corrugations like they don’t even exist. 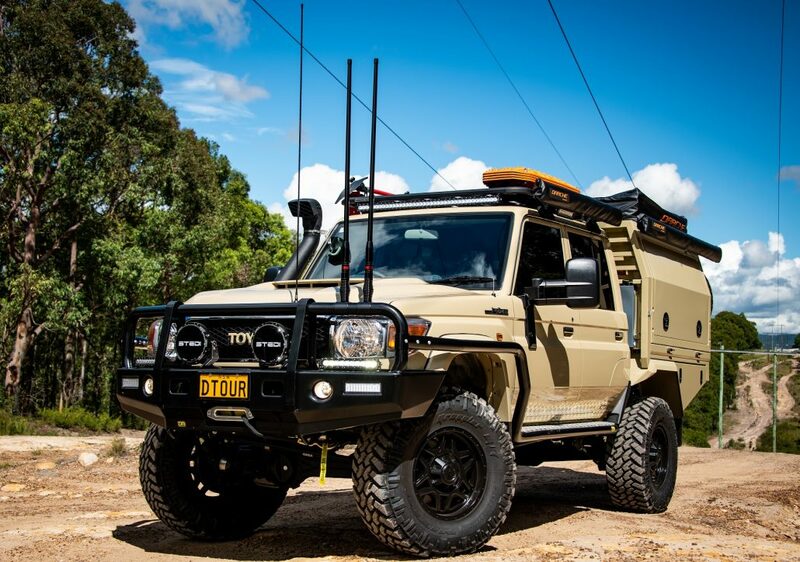 This kit takes the legal GVM up to 3900kg for the 79, improving its load carrying capabilities for those long distance remote touring stints when you need to carry as much fuel, water and supplies as you can- all while riding at a legal 4 inches of lift. Airbag Man high pressure airbags assist with load carrying duties giving an adjustable load rate and the system is controlled using the Airbag Man Dual Control on-board inflation kit which runs a compressor and reserve tank in the tray tool box and pressure can be adjusted on the fly, in-cab. 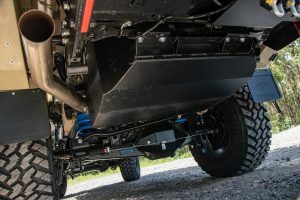 Protecting the front end of this tough 79 is a TJM T13 Outback bar, TJM brush bars and side steps – all running 63mm tubing and the bar houses a TJM 12,000lbs synthetic rope winch to take care of recovery duties when the going gets tough. 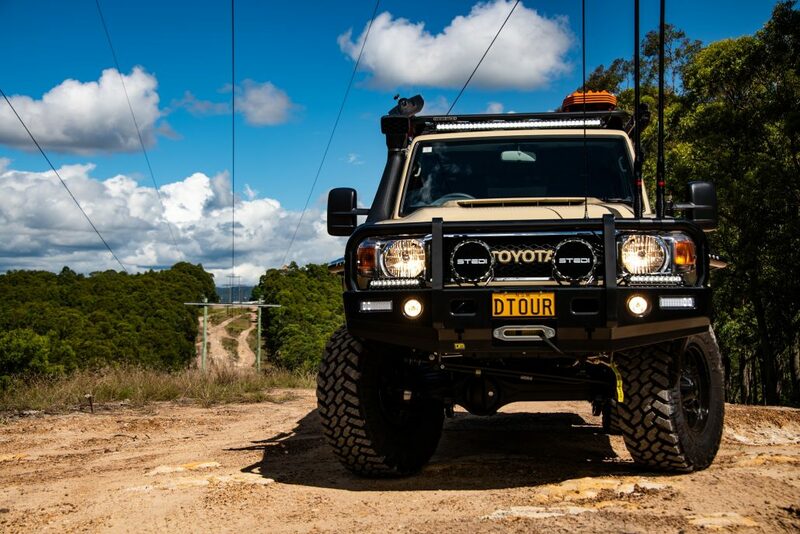 A set of Stedi Type-X Pro LED driving lights are housed on the bar and turn night in to day on those overnight runs. 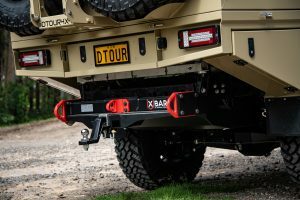 Out-back sits a Hayman Reese X Bar incorporating three extra heavy duty recovery points and a heavy duty tow bar. Chris might get this thing stuck every now and then, but he’ll certainly have no problems getting it un-stuck. We sent this Sandy Taupe beast up to the guys at Streamline Automotive to work their magic with it and they were able to tune the sleepy VDJ motor up to over 135kW and over 640Nm of torque at 1900rpm. 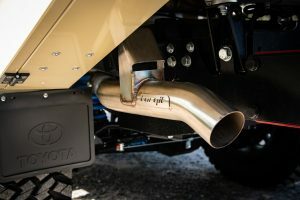 Torqit puts together a 3.5″ stainless steel exhaust for the Jmacx unique routing requirements and that in combination with the Safari Armax snorkel gets those gases flowing much more efficiently and the engine now breathes much better than the restrictive factory system would ever allow it to. 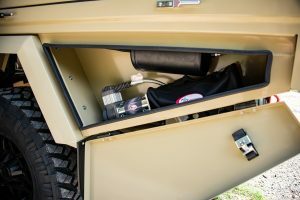 A Taipan billet alloy catch can and Diesel Care secondary fuel filter system give the engine added protection from diesel and oil contaminates and there’s also a TJM dual battery system installed under-bonnet for extra power to run lighting and accessories in the vehicle using a Century AGM battery with solar input. 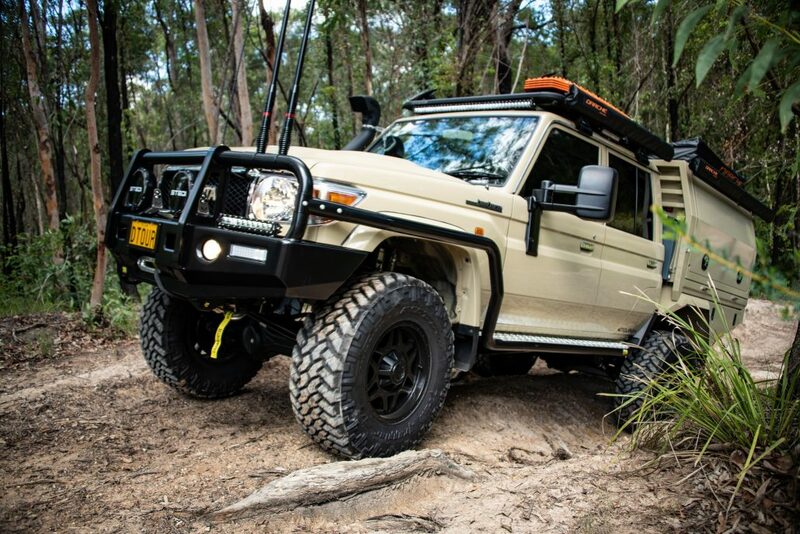 An NPC heavy duty clutch was installed to handle the added weight and power and help pull the big girl through the rough stuff and a Long Range Automotive 180L long range replacement tank was installed to give the fuel range required to do some decent remote touring. 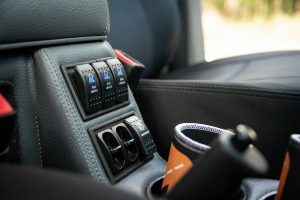 The inside of Chris’s truck received the once-over as well with Department of the Interior supplying both over head and centre consoles for added storage and comfort as well as providing a great mounting point for the extensive switch panels required to control all the accessories in the truck. 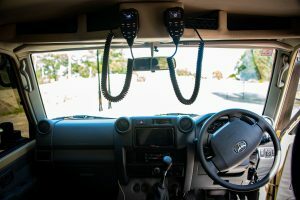 House of Soundz at Kotara fitted out a thumping Kenwood sound system including rear seat mounted sub-woofer with a GME AM/FM booster antenna, and communications are handles via two GME XRS 330C UHF radios with two GME 6Dbi gain heavy duty antennas. 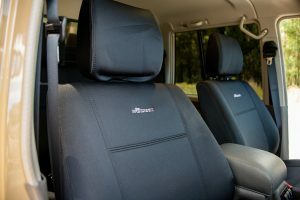 Wet Seat neoprene seat covers by Inland Australia protect the original fabric and a set of Sandgrabber floor mats by No Bull keep the mud and sand out of the carpet. 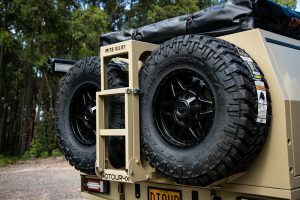 The whole build is rolling on a set of ROH Maverick 17x9s with custom colouring and are wrapped in a set of Nitto Grappler mud terrains measuring 35x 12.5 inches. the original GXL flares were colour coded to match the whole Sandy Taupe theme and make awesome finishing touches on what we think is the tidiest Sandy Taupe 79 getting around. Chris is stoked with his new build and can’t wait to rack up some big kays on the big beast and we are excited to see another big build roll out of the workshop. 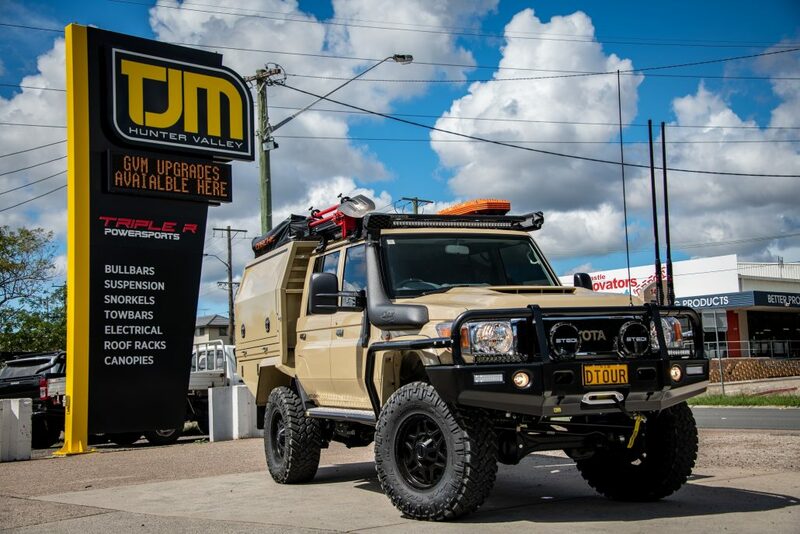 You can see more of Chris’s truck by following him on his Instagram page @dtour4x4.